As I meet with entrepreneurs I am amazed at the number of people professing to be experts that are preying upon entrepreneurs struggling to grow their businesses. I discussed “marketing tools “in my previous post; who they are and how to quickly spot one so you don’t get burned. A new entrepreneurial predator has emerged that is referred to as “smores” or social media whores. In this post I plan to share how social media, social marketing, is a key component of any businesses overall integrated marketing, and how to quickly spot the smores so you do not get burned. Last week I had lunch with David Barnhart a local thought leader in the social media space here in Arizona and we were discussing my post about the amount of “marketing tools” that are out there preying upon trusting entrepreneurs. David shared with me the new predator he sees is what he called a “smore”. I did not want to show my ignorance as I had not heard this term before so I let David keep discussing this topic that was obviously a subject he was deeply passionate about. What he described as “smores” are self professed social media experts who take large retainers from unsuspecting clients, they over promise and under deliver. They chase shiny social media objects but lack business acumen.They are familiar with the tools of social media, but they are not master craftsmen in marketing and business growth.He went on to say how this new marketing tool gives others who practice social media with a focus on helping clients achieved desired outcomes a bad name. Guy Kawasaki refers to smores as opinion leaders so I am a bit confused.Eventually I had to ask….why do you call them “smores”? He explained, “Oh that’s easy,… it’s because they are social media whores”. So for this post smores are social media whores who understand social media tools but lack an understanding of how to apply these tools to solve the business problems of entrepreneurs. So what can an entrepreneur do to add social media to their integrated marketing and not fall prey to smores? Most of the entrepreneurs I work with value the benefits social marketing can provide, however they lack a clear plan and a desired goal for this tool and do not know how to determine the marketing tool smores from the strategic social media partners who will add value to your business. So I thought I would create a post, based on my admitted limited knowledge in hopes of starting a discussion on this growing problem. If you are going to make the investment in social media do some research first. I am shocked how quick some entrepreneurs are to cut checks but not crack open a book, read a few blogs, or do a little googling. I am not a social marketing expert but there are expert’s readily available, thought leaders in the space. 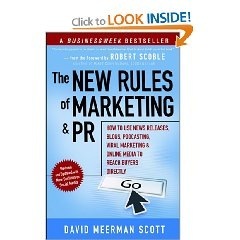 Before you start investing in social media I recommend you read David Meerman Scotts two books : The new rules of marketing and PR, The World Wide Rave, and spend some time on his blog Webink and watch the following free webinar. 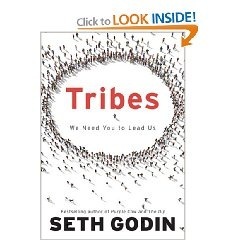 In addition I recommend you read the book Groundswell by thought leader Charlene Li, and the book by Seth Godin tiled : Tribes to gain a baseline understanding of this thing everyone is calling “social media” and learn how you can use it for your “social marketing” efforts. In my view, social marketing is about creating relationships and leveraging those relationships that ultimately results in revenue. If someone in the social media space does not know who Guy Kawasaki, Charlene Li, David Meerman Scott or Seth Godin is…you may be dealing with a social media whore. I hear smores saying social media is free…They are often correct in that you may not be cutting checks to ad firms for creative or media buys, and you may not be paying a $5,000 PR monthly retainer, however one common challenge all the entrepreneurs I work with have is time. Your time, the time of your team members has a cost. You may capture it as a fixed cost, or variable for outsourced contractors, but there is a cost. Often the biggest cost is not the hourly rate your time is worth, but the opportunity cost. When you engage in an activity you have strategically decided this activity ranks higher and will produce greater outcomes than other activities you could be doing. If someone in the social media space tells you that social media is “free” you may be dealing with a Smore. Everything you do should have an objective, a goal that is in alignment with the flight plan for your business. I think it was Einstein who said “if you can’t explain something to a six year old you probably do not know it yourself”. Before you invest, your time or hard costs with a social marketing out sourced partner make sure you have a clear set of objectives and goals in mind that you can clearly explain. Do not invest until you can explain what you are about to do , or have a social marketing partner explain what you are about to do, so that a six year old can understand it. If you meet with someone in the social media space and they want to talk about “putting you out there” without discussing goals and some measurement of those goals… you may be dealing with a smore. Social Marketing is about marketing you, your business in areas that build relationships that offer the optimum return. Social Marketing strategic leaders like Elizabeth Hannan will discuss with you the creation of “outposts” in which you strategically plant yourself and begin building relationships. Each of these outposts has specific demographic patterns and their own educate. You will also want to cross pollinate your outposts once they are established. For example, I chose Linked In, Twitter, Facebook and Freindfeed and my blog as my initial outposts that I wanted to develop based on targeting entrepreneurial leaders. The location of the outpost you choose is based on those who participate in those communities. You will want to have your strategic partner clearly explain with the use of techno graphic data how your buyer personas use technology and this will guide you to the right social marketing tools. If you meet with someone in the social marketing space and they talk about putting you “everywhere” as opposed to strategically placing you in outposts based on your market and buyer persona’s…you may be dealing with a smore. Before you begin your efforts in social marketing you must clearly understand your brand, your brand promise, and the problems you are promising to solve for your market. Decide the voice you wish to have that would resonate most with your buyer personas. For example, back in the day …one of the market’s I opened for the plastic packaging company I was serving was libraries. Librarians are highly educated amazing underutilized resources for entrepreneurs in the area of research by the way. They are proficient at finding and researching areas of interest for themselves and those they serve. The voice we chose to use for this buyer was a very detailed explanation of our products and how they specifically solved issues for librarians like the protection of their VHS movies being returned in drop boxes that also has large books falling thought the trap door. We listened to their pain points, and we clearly explained how we solved them, and provided additional data on the type of resin we used, the molding process, and so on. Our brand promise was “video packaging designed for libraries” when our competitors focused on the other industries they supported and their message was…”if it’s good enough for Hollywood video it would work for you”. Within 24 months we dominated the library packaging space and this new adjacent market produced over $4 million dollars in incremental revenue and profits 20% higher than our primary market. If you meet with someone in the social marketing space and they do not spend the time on the upfront to understand your brand and your brand promise….you may be dealing with a smore. As market leading entrepreneurs you know the value of inspect what you expect, and “a goal that is not written down is a dream”. So establish clear measurable indicators that you want as outcomes for your social marketing efforts. These objectives will be different that typical goals like sales by region, by client. For example you may want to measure the number of followers of your blog. You will want to connect with Google analytics and quantcast so that over time you can gain insight into who is visiting you, what is their demographic, key words searched for , how they came to find you and your bounce rate. I attended a workshop recently by Jennifer Maggorrie who is an obvious key strategic partner in the social marketing space and she discussed some other goals may include; the frequency of repeat business, number of new prospects by month, number of new inquires, and establishing things like Yacktrack.com and Google Alerts to see what people are saying about you, your business and your other team members. Social marketing is about establishing and leveraging relationships. A key component of any relationship is trust. Your social marketing efforts help to establish trust much earlier in the relationship and therefore it is my theory (and I may get blasted by David Meerman Scott for saying this) but I believe a strong social marketing effort will reduce the selling cycle for your products. So determine the current cycle and measure the cycle over time after the implementation of your social marketing initiatives. With every engagement ask your prospects and clients how they found you and increase you efforts in the areas that rise to the top and reduce or eliminate your investments that do not bear fruit in relation to your objectives. If you meet with someone in the social media space who says you can’t expect a return on your social marketing investment …you may be dealing with a smore. I have listed a few of the strategic social marketing thought leaders that I have gained knowledge from but in no way am I an expert in this space. I am someone who helps entrepreneurial leaders reach and exceed explosive growth in revenue and profits and I recommend the use of social marketing as a key component of a team’s overall marketing strategy. I have a strong respect for social marketing. Have you decided to make an investment in social marketing? How did you pick your outposts? 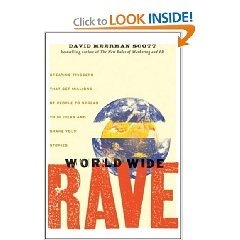 Strategically with an appreciation for techno graphic data or did you just jump in and hope? Do you have a smore preying upon you right now? Was this post any help? As entrepreneurs we have enough to keep us busy and we cannot afford to engage with self proposed experts who we learn after months of paying retainers are actually marketing tools and whores. As one of the top leaders in the space, any additional advice on how to spot a smore before they cost an entrepreneur money? Let me ask another way, as the auhor of Tuned In David , this is an ; urgent, pervasive problem, and entrepreneurs are paying now to solve…they are just paying the wrong folks in some cases. Great post my friend! I had never heard of “smores” either but I do see and hear them regularly. I actually came across your blog by reading a comment you left on Jeremy Epstein’s post “the value of the echo chamber” (who is a good friend and business colleague of mine here in DC). I read your comment about seeking guest bloggers and would love to discuss with you the possibility of being able to provide some value to your readers by sharing my own experiences of being an entrepreneur and navigating today’s new business landscape. I’ve recently started a mini-conference event here in DC and my most recent one in August features Jeremy as a panel member along with two other business and thought leaders here in the DC area. You can see it here. http://www.youtube.com/watch?v=mJ0Im3aXSLY I’m glad a I came across your response on Jeremy’s blog! Oh and also I love your list of thought leaders especially Gladwell, Sun Tsu, and Einstein – Awesome! I look forward to hearing back from you. Cheers! I would be honored to serve you and your community.My Email is Mark@outbsolutions.com . Mark, loved your post! So many entrepreneurs are hopeful that social media alone will magically transform their startup into a cash flow positive business. Sadly there are smores that prey on that belief, wasting valuable time and producing little, if any, outcome. Thank you for this great post, you have provided a greater resource of knowledge for the social media community, and for entrepreneurs. I recently graduated a Professional Communications Degree program and this is an excellent supplement to what I learned about online communities. Communities who meet online are seeking information and resources, not unsolicited cold calls from those who have nothing to offer but items to purchase. Adding value is the only way to gain merit within an “outpost” (love this term).